Welcome to day one of the Mistletoe Make and Bake event. Each day the designers will post about that days topic. They will each have a recipe to share with you. The designers of the day will also include a project that can be easily made as a gift for the holidays. Leave a comment on each designers blog every day for chances to win the Grand Prize drawing. So let the fun begin…. Today’s topic, Christmas Trivia. A bit of information about Rudolph the Red Nosed Reindeer from Wikipedia. Rudolph the Red-nosed Reindeer is a character created in a story and song by the same name. The story was created by Robert L. May in 1939 as part of his employment with Montgomery Ward. The story is owned by The Rudolph Company, L.P. and has been sold in numerous forms including a popular song, a television special (done in stop-motion animation), and a feature film. Character Arts, LLC manages the licensing for the Rudolph Company, L.P. Although the story and song are not public domain, Rudolph has become a figure of Christmas folklore. The song tells the tale of Santa Claus’s ninth and lead reindeer who possesses an unusually red-colored nose that gives off its own light, powerful enough to illuminate the team’s path through inclement winter weather. 1.Which reindeer was identified as Rudolph’s father? 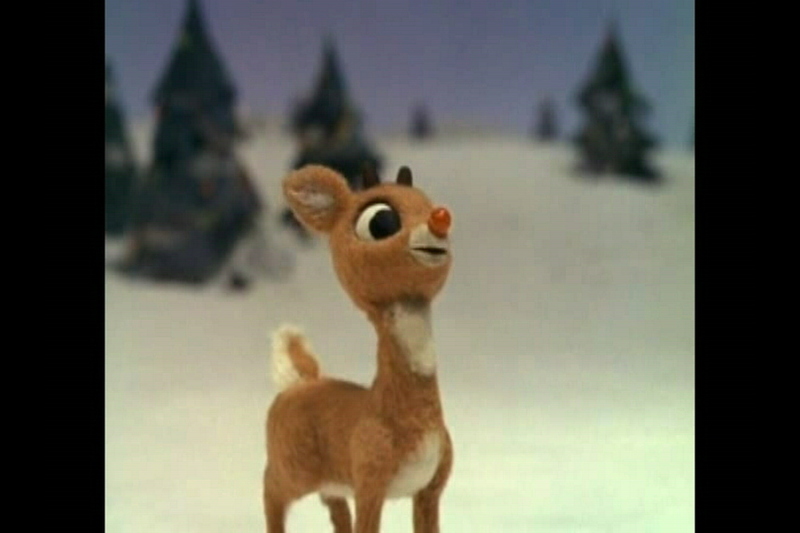 2.The Rudolph the Red-Nosed Reindeer Television special was originally aired on NBC in what year? 3.What comic book company based a series of 13 Annuals titled ‘Rudolph the Red-Nosed Reindeer’? 4.This reindeer helps Rudolph fly at the reindeer games by telling him he is cute. 5.What do they call the Abominable Snow Monster who pursues Rudolph throughout the adventure? 6.Who is the name of the jack-in-the-box at the Island of Misfit Toys? 7.Also on the island of misfit toys was a toy bird who instead of flying did what? 8.This Johnny Marks song featured in the special has become a Christmas Classic. 9.What does the misfit cowboy ride on for transportation? 10.Which of the following toys was NOT on the island of misfit toys? Be sure and visit all the Mistletoe Make and Bake designers, leave a comment on each to be entered in the Grand Prize drawing. Here is the complete list. 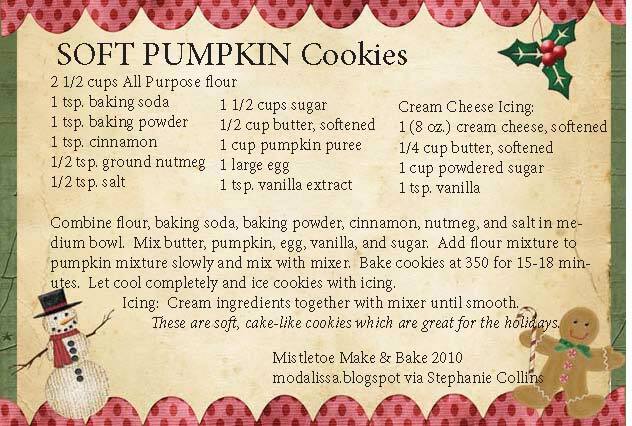 Melisa Morrison – Sweet Home Quilt Co.
Pumpkin cookies with cream cheese – perfect for the holidays. PDF link is not working. Thanks! Thank you for the recipe, I did not know Rudolf(I am dutch and live in France) but he 's a funny guy…. Thanks for the Rudolph trivia and the recipe. 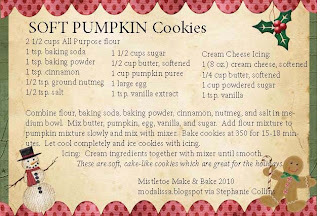 Love pumpkin so I should love these cookies. Thanks for it. The trivia was too difficult for me! However, the recipe would be great for Thanksgiving. The trivia was fun, and I was looking for a new pumpkin recipe. Thank You. Judy S.
Yum. Thanks for the recipe! Thanks for the recipe and the fun quiz. Great trivia. I didn't do as well as I thought I would! Loved the trivia test….I actually knew some of the answers!